The Faculty of Science Study Award and the School of Science Research Award for AY 2012 were given to the 40 students listed in the figure. Award ceremonies were held for graduate recipients on March 25 (Monday) and undergraduate recipients on March 26 (Tuesday), 2013. The School of Science nominated three excellent students for the President’s Award: Mr. Tomoya Onozuka (4th year undergraduate), Ms. Mariko Harada (master’s course), and Ms. Arisa Hirano (doctor’s course). 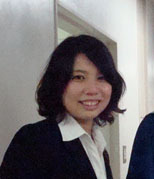 To our delight, Ms. Hirano won the President’s Award. She has proposed a novel concept for the molecular mechanism of the circadian clock regulating the behavioral rhythms of animals and achieved breakthrough research results. At the President’s Award ceremony held at the Koshiba Hall on March 21, President Junichi Hamada presented an award certificate to her. We extend our sincere congratulations to the award winners who completed the courses at the School of Science demonstrating excellent performance and internationally high levels of academic achievement. We hope that they will make further contributions to the advancement of academic research throughout the world.